All Progressives Congress (APC) National Chairman Adams Oshiomhole is seeking dismissal of a suit seeking his probe by the Economic and Financial Crimes Commission (EFCC) for alleged corruption. A Federal High Court sitting in Abuja had ordered investigation of his spendings as Governor of Edo state. Justice Anwuli Chikere had directed that Oshiomole be served with an application brought before the court by an anti-corruption crusader, Bishop Osadolor Ochei seeking an order of mandamus compelling the EFCC to arrest and commence criminal proceedings against the APC chairman.. The Judge, who also ordered that the anti-graft agency be also served with the court process, stressed that the service be done within five days from October 9 when the order was made. But Oshiomhole on Tuesday questioned the plaintiff’s right under the law, to seek to compel the EFCC to probe his tenure as Edo State Governor. 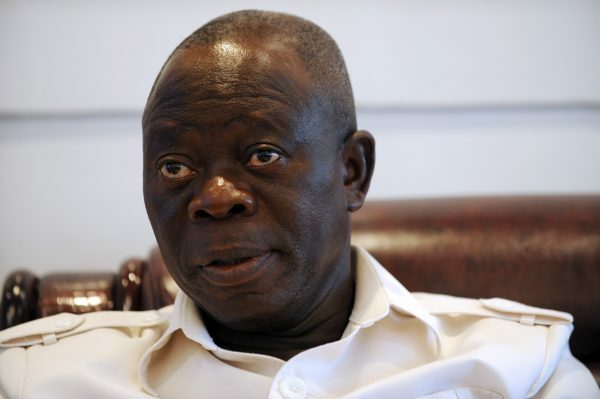 Oshiomhole, in a notice of preliminary objection filed by his lawyer, Damien Dodo (SAN), argued that the plaintiff lacked the locus standi to bring the suit. In the objection, supported by 10 grounds, Oshiomhole argued that the suit has become a mere academic exercise since the plaintiff failed to file the suit for judicial review within three months of the occurrence of the subject of the case. He argued that the action or inaction of the EFCC being subjected to review by the proceedings occurred on December 13, 2016, while the plaintiff only institute the action for judicial review on June 13, 2018. The APC National Chairman noted that this came about 18 months after the occurrence of the alleged failure being complained about. He argued that the court lacked the jurisdiction to entertain the suit for failure of the plaintiff to begin the action within the time provided by extant rules of the court and for failure to disclose locus standi to file the action. The post Oshiomhole Reacts To Suit Seeking His Probe For Corruption appeared first on LATEST NIGERIAN NEWS BREAKING HEADLINES NEWSPAPERS.